Word watch: goodbye "media agency", hello "communications services"
There are few better signs of the changing media environment than when someone changes the name of what they do. Ad agencies became media agencies, and now media agencies are re-dubbing themselve "communications services", according to an item in MediaPost. While there is confusion on where creative agency role stops and media agencies' role starts, the media buying role isn't going away, just becoming more complex. MPG North America CEO Charlie Rutman told a panel discussion "The money is following the behavior patterns of consumers. The Internet has a seat at the adult table...We've been weaned a little bit off the crack-cocaine habit of TV." 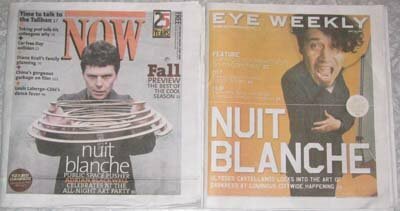 It's probably not the first time it has happened, but Torontoist pokes a little fun at the two night-out Toronto giveaway mags eye and NOW for having the same cover subject this week. Not a major event like the Toronto film festival, mind you, but "Nuit blanche", whatever that is. As one reader noted, acidly, it is driven by who gets free tickets. Or it is a sign that there is a killer publicist out there. "What's interesting is that in all the places where I had a lot of fun, I also had a lot of anxiety. In this business, they go hand in hand." Magazines usuallly have a hard enough time getting their current issue in front of the public through the byzantine maze of the single copy sales network. Often, we don't give a thought to the fact that, in many instances, back issues of the magazine have untapped potential. I was prompted to think about this by a presentation this week to a group of "creative industries" types in Toronto (part of a launch of a new goverment funding initiative). Ajay Agrawal, a professor who teaches at the Rotman School of Management at the University of Toronto, made a presentation about the economic aspects of "creative clusters"; why they exist in some places and not others and what drives them. His view was that among the new business models used in creative industries (in which I would definitely include consumer magazines) the first was "flexible pricing". He gave the example of the whole range of prices offered for tickets at the Tarragon Theatre in Toronto or the auctions being run by Ticketmaster to sell up to 30% of the tickets for major tours. (Until recently, Ticketmaster had been selling fewer tickets at higher prices; people in the concert industry say pricing has meant that only 45% of tickets released to the public get sold). It occurred to me that the magazine industry is pretty good, but somewhat secretive, about its own pricing regimen. We all sell subscriptions at variable prices (hence, the "average" price on our audit statements). We are masters of special offers and testing. But most of us wouldn't consider auctioning subscriptions. Our only solution seems to be to sell magazine subs more and more cheaply. Unlike airlines and concert promoters, whose inventory vanishes like lamplight the moment the plane takes off or the first chord crashes, magazine publishers have products that stretch beyond their sell-by date. Yet we have no mechanism to offer "day-old bread" discounts and never make last month's issue available in any way that a sensible member of the public would take advantage of. (If a reader wants a back issue, they must come to us and, often, pay a premium.) Many, many magazine issues have a timelessness that would lend themselves to, say, having a rack of "recent valuable back issues" or a "missed an issue?" rack, where people could buy at a significant discount off the current cover price. Say, 50% off. Has anyone ever tested whether this would cut sales of current issues? Or would they bring in incremental revenue? Surely anything that gets the magazine into readers hands rather than the knives of the shredders is a good idea. Since he sold most of his Key Publishers assets to St. Joseph Corporation in 2002 Michael de Pencier has not been standing still. He has been building a portfolio of "green" ventures. At first, it was Investco Capital Corporation, private equity funds that invest in wind power, organic foods and water purification projects. Then it was Green Living Enterprises, with a shift back into publishing and Green Living magazine, a consumer magazine promoting sustainable practices. According to a story in mastheadonline (sub req'd) one million copies of Eco Options will be distributed starting this month through Home Depot’s chain of 142 stores. The large format, 82-page premier edition is the first of they're not sure how many issues annually (frequency apparently depending on uptake). Green Living president Laurie Simmonds says “They are considering [publishing] quarterly and binannually, but they have not confirmed,” says Simmonds. Company spokesman Rob McEwan says a rate card is in the process of being developed to accommodate appropriate third-party advertisers. In the premier issue, which contains mostly editorial, the few ads that do jump out are for Honeywell (thermostats), Venmar (air filtration systems) and Waterpik (shower heads)—not quite third-party ads as they are complementary to the in-store “Eco Options” merchandizing program. Eco Options is designed by Donna Braggins (creative director), Gary Hall (art director) and Ken Rodmell (Green Living's VP Creative). Braggins and Hall will be remembered as the design team at Maclean's. Rodmell is one of the deans among publication designers and, for many years taught today's art directors at the Ontario College of Art & Design. October 27 is less than a month away, but it's the deadline for the first round of the new funding source from the Ontario Ministry of Culture (administered by the Ontario Media Development Corporation). The OMDC held the first of three information sessions yesterday and is hosting two more today to outline the criteria and the details of the Entertainment and Creative Cluster Partnerships Fund. There is $1.8 million allocated for this round. The minimum that can be applied for is $25,000, the maximum...well, there is no maximum, though it is expected that the grants will range between $50,000 and $150,000. So the Ontario government is being serious about this. The funding is capped at 50% of the total direct costs of a project (this may go as high as 70% with OMDC advance approval). It appears that applicants need to put at least 25% of the project costs in themselves in cash (that is, not in kind). The fund is open to all the "creative content industries", including magazines, film, television, interractive digital media, music recording, book publishing and commercial theatre, so the competition for the money will be tough. It's not possible here to go into detail about what's expected in these areas, but more information and full details can be found at the OMDC website. Any applicant must consult with OMDC staff before completing an application. The coordinator for the fund is Jennifer Brown. Every application needs a minimum of two primary partners, such as a trade association, a consortium of companies, a college or university or an industry-recognized festival, conference or congress. An application can have any number of secondary partners. This, along with the very short deadline, may cause some problems because the OMDC recommends a written partnership agreement (particularly where the outcome of the grant will be some asset or something with lasting equity value). Anything that involves lawyers usually takes longer than a month. The applications will be judged by a panel of representatives from various Ontario ministries (Culture, Economic Development and Trade, Research and Innovation, Training, Colleges and Universities, Small Business and Entrepreneurship), probably at the assistant deputy minister level. It's hard to know how tight is too tight when it comes to media sponsorships and partnerships, but they are becoming a vital marketing tool for many Canadian magazines. Canadian Business magazine, for instance, is certainly cementing its relationship with a number of industry groups. It is a sponsor and partner for the nation's largest interior design trade show and its awards for booth and product design. The IIDEX/NeoCon Canada Innovation Awards were presented at a ceremony at the trade show this morning, according to a release from Rogers Media. Joe Chidley, the editor of Canadian Business spoke at the presentation and Rachel Pulfer, Features Editor was a member of the judging panel.Winners of the Innovation Awards are to be featured in a forthcoming issue of the magazine. The Innovation Awards are run by the Interior Designers of Canada and Merchandise Mart Properties (Canada) Inc., managers of IIDEX/NeoCon Canada, the country's largest exposition and conference for the design, construction and management of the built environment. The Association of Registered Interior Designers of Ontario (ARIDO) owns the annual fall design exposition. If you think print advertising is enough, think again, says Robin Steinberg svp and director of print investment at Publicis Groupe's MediaVest. She told a packed New York Times auditorium (according to a story in AdWeek) Tuesday morning that pressure is mounting on magazines to offer advertisers multiplatform packages that tie-in to the Web, mobile and other appropriate digital media. To maintain their share of ad dollars, publishers have little choice but to comply. "It's getting harder and harder to sell" clients on the notion that print is an essential medium in the digital age, she said. Digital ad budgets are increasing exponentially, and "it's got to come from somewhere and it's coming from both print and TV budgets," she said. "You can't just sell me a page" anymore, Steinberg told her audience. "You have to solve problems and the consumer has to be at the heart of your marketing plan." Readers "love and trust some magazines," Steinberg said. Those emotional ties must be tapped and publishers should encourage dialog between readers and the publication via digital media, she added. "Give your readers options to interact with each other and your brand. Build an online community where the common thread is your brand," she said. And that's just the first step, Steinberg said. "You have to rethink every facet and challenge every notion," down to the very basics of the business. "Is the CPM the right metric [to buy and sell ads]? Is MRI the only tool for audience measurement?" she said. Steinberg said accountability is more important than ever: "You need to address this. Stop ignoring it." Distribution approaches need to be re-evaluated, said Steinberg. It's no longer acceptable, she said, for new subscribers to wait four to six weeks for the first issue to arrive in the mail. "That makes no sense," she said. "And they won't wait." Beyond that, she urged publishers to "find better and more effective ways to reach readers. Follow the consumer," she said, noting that perhaps bigger retail "boxes" like Costco are more effective distribution outlets than grocery chains like Food Emporium. Clients and agencies need to accept part of the blame for previous failures to communicate, Steinberg said. In the past, agencies would issue RFPs in search of big ideas, she said, "but we expected you to guess what the client objective was." She also acknowledged that communication gaps still exist, but that agencies are trying to correct such gaps. "We will change," Steinberg said. Big ideas are still in demand, she stressed. "Don't be afraid to get it wrong." It's better to take risks than offer up the same old tired proposals, she said. It ain't what you do, it's the way what you do it; as apparently true in magazine reading as in other aspects of life, at least according to a paper published by the Magazine Publishers of America. The paper can be found at the MPA website and was summarized in a report in MediaPost's Center for Media Research. The Value of Magazine Readership study is an update, pulling together new information from a number of sources, of an earlier study published by the MPA and it suggests that many assumptions may not be accurate about the connection between consumers' reaction to magazine advertising and the price paid and circulation source for the magazines that they read. Tom Robinson, Managing Director, Affinity Research LLC, noted: "Based on interviews with more than 60,000 magazine readers in 2006, on average, more than half took or plan to take action as a direct result of exposure to specific print ads. Reader action levels were similar for both paid and nonpaid readers." Source: Affinity's VISTA Print Effectiveness Rating Service. Base: Actions taken based on respondents recalling specific ads, multiple responses. The doyenne of Canadian House & Home magazine, will have her television show, House & Home with Lynda Reeves, on the screens of the House and Garden TV in the U.S. starting October 7. According to a story in mastheadonline (sub requ'd) . The popular program, which makes a powerful one-two marketing punch with the very prosperous magazine, is already seen daily on Global Television in Canada and has now been picked up by Scripps Networks in the U.S.
Reeves, who is president of House and Home Media of Toronto and Publisher of Canadian House & Home magazine is the show's host and a regular guest is CH&H Editor Cobi Ladner. HGTV is one of the many offerings of the Scripps Networks brand. These include include Food Network, DIY -- Do It Yourself Network and Fine Living. Home & Garden and Food Network each can be seen in about 80 million U.S. television households. Scripps Networks Web sites include FoodNetwork.com, hgtv.com, DIYnetwork.com and fineliving.com. Scripps Networks programming can be seen in 33 countries. Scripps's home shopping subsidiary, Shop At Home Network, markets a growing range of consumer goods directly to television viewers and visitors to the Shop At Home Web site, shopathometv.com. Shop At Home reaches about 44 million full-time equivalent U.S. households. Scripps also operates Scripps Howard News Service and United Media, which is the worldwide licensing and syndication home of PEANUTS and DILBERT. There was no indication whether the push into U.S. TV presages a push for an Americanized version of the magazine into the U.S. market. One of its salutary values to Canadian readers is that it talks about Canadian sources and to serve the U.S. market would either require development of a split run or a wholly separate U.S. edition. Canadian magazines which have plunged into the huge U.S. market have found it expensive and cutthroat. Glamour is very looks-conscious so, at the risk of sounding ridiculous, they need to be photogenic, or at least comfortable in front of a camera! [...] The editor likes to approve each case history, so when I send her a short bio ("X is aged X and lost her husband X in the war X") she likes to see a jpeg pic too. I know this is a big ask, but it's something she demands! Hey ho! MFAW members refused Glamour's request; a spokesperson from the organization noted, "We felt the 'hey ho' bit crossed the line of good taste." 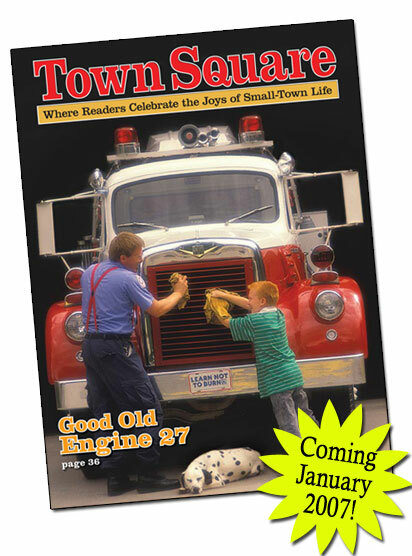 Dynamic Resource Group (DRG) in Berne, Indiana, will begin publishing a new bi-monthly magazine in mid-January called Town Square, which will circulate in the United States and Canada to celebrate life in small towns. It will be almost entirely reader-written. Who, you may well ask, is DRG? It is a well established, family publishing and printing company that operates somewhat below the radar of the magazine publishing world. Wholly owned by the Musselman family, it has been in business since 1925 and publishes an astonishing range of 14 very profitable craft magazines, as well as books and catalogues, catering to those interested in knitting, crochet, cross-stitch, and related handcrafts. And they do contract publishing as well as operating a fulfillment service out of a 60,000 square foot facility in Big Sandy, Texas. DRG will promote the new magazine in its existing magazines and in electronic newsletters (the company also operates 40 (!) public websites. Other DRG magazines (all of which can be found on Canadian newsstands) include Quilter's World, Creative Knitting, Good Old Days, Simply Beads, Paper Works and Home Cooking. The magazines are published under five different brands: Annie's Attic; American School of Needlework; House of White Birches; Clotilde; and the Needlecraft Shop. The company hasn't said how large the circulation of Town Square will be, but makes the somewhat overblown claim that this is a brand new idea (which will come as a surprise to magazines like Our Canada, from Reader's Digest). Here is the promotional copy from the Town Square website. 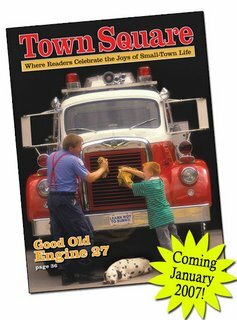 Town Square is the first and only magazine that celebrates life in the smaller North American communities, where you count your neighbors as friends and you can count on them in a pinch. It's a world of laughter and surprises, friendship and caring. There's a more relaxed pace in smaller towns, and yet, these friendly places are filled with enough activity and fun to rival anything found in big cities. Those who live in small communities know it, and Town Square is being published to prove it. So many magazines these days are published to highlight city life, we felt it was high time small towns received a little recognition, too. And if you agree, you can be published in this exciting new magazine, and give your town some well-deserved notice, too! Canadian titles did very well at this month's 46th annual International Regional Magazine Association (IRMA) conference on Sept.12, 2006 in Duluth, Minnesota. Cottage Life won 10 awards, including three golds. British Columbia Magazine won six awards, including two golds. The IRMA awards recognize international standards of editorial excellence among more than 40 regional -- largely tourism and outdoor-related -- magazines. Award of Merit, Historical Feature, “The war that nobody won,” Winter 2005; John Lutz. It's easy to sniff at purveyors of puffery like Hello!, lamenting our obsession on the rich, famous, pampered and beautiful. But interested we are, and Hello! does it better than most. You like the idea of Canadians appearing in the big blender, which we try to do in newspapers every day. This isn't for everyone -- not me, for one, or most of my friends of all ages. But good wishes are due just the same, especially when the product, borrowed or not, is as professional as Hello! They're giving it a real shot, and that's a welcome thing. -- Alan Kellogg writes a surprisingly positive column in the Edmonton Journal about the launch of Hello!. Folio: the magazine for magazine management, has launched a blog called Folio: Forum, which looks remarkably like what Canadian Magazines has been for the past year. Good idea. Glad we thought of it first! Mastheadonline has published a longish item on The Walrus, which may, or may not, allay people's angst about what's going on. Ken Alexander expands on his view that the departure of the Publisher and several directors and the deputy editor is a good and necessary thing. Publisher Bernard Schiff says he left because of too many disagreements on fundraising and other fundamentals. Departed Deputy Editor Tom Fennell said he had "enjoyed every minute" of his time at the magazine and "Generally, I didn't have a bad relationship with Ken." It must be pointed out that these views are at variance with what is being said elsewhere, anonymously and privately. It looks like elementary damage control. But we will take them at their word until there is proof to the contrary. Word on the street in New York is that the Time4Media properties (18 special interest magazines that Time Inc. has put up for sale) could fetch between US$300 million and US$400 million. It's also expected that frontrunners to pick them up are Europeans who have the leverage of the strong euro. This according to a column in the New York Post. Rumour is that the confidental briefing books for the sale, which won't even be released to potential buyers until mid-October, suggest that the titles have free cash flow in the range of $30 million. "Magazines are growing in stature in Canada, demanding an ever-increasing readership and media market share, despite heavy competition from south of the border-and regional titles have been demonstrating the strongest growth curve. "Canadians are magazine readers. "Maybe it's the climate. Consumer magazines, in particular, and regional business magazines,engage audiences emotionally and intellectually more effectively than any other medium, and the advertising community in Canada is increasingly responding to that reality". -- Jim Gourlay, first president of the Atlantic Magazine Association, as part of the kickoff for the new association. Gourlay is co-publisher of Saltscapes magazine and publisher of Eastern Woods & Waters magazine. Other officers include: Sheila Blair-Reid, co-vice chair, Metro Guide Publishing, Halifax, NS; Anne van Loon, co-vice chair, DvL Publishing Liverpool, NS; Patty Baxter, Secretary, Metro Guide Publishing, Halifax, NS; Dianne Williams, Treasurer, Progress magazine, Halifax, NS; and board members Bill Skerrett, Atlantic Journalism Awards, Dartmouth NS; Shawn Dalton, Saltscapes Magazine, Dartmouth, NS; Krista Hewey Ivanov , Lifestyle Nova Scotia Magazine, Halifax, NS; Dawn Chafe, Atlantic Business Magazine, St. John's, NF; Leslie McNab, Downhomer Publications, St. John's, NF; and Leith Orr, Advocate Printing and Publishing, Pictou, NS. The Atlantic Magazine Association was started with help from the Atlantic Journalism Awards and the Department of Canadian Heritage. It represents 81 magazines, from 54 publishers, with a net circulation of 7.5 million copies a year. Helvetica is a feature length documentary by Gary Hustwit about one of the most ubiquitous and popular typefaces in the world and its impact on global, visual culture. Here is a story about it in Aiga: Journal of Art & Design. The film examines the life and legend of a face that will celebrate its 50th birthday in 2007. It will be on the film festival circuit next year. And shown is one of three limited-edition (100 only) posters produced to mark the creation of the film (this one is by the London design studio Build). They cost $125 U.S.
And, here is something that you could wear to the premiere. Chatelaine, which seems to take its sweet time filling key editorial positions, has finally named an art director, according to a story in mastheadonline (sub requ'd). It is Cameron Wiliamson, who was creative director at Toro. Chatelaine editor Sara Angel met Williamson when the two worked at Saturday Night (she as features editor, he as an intern). Flare magazine is to publish a special issue that celebrates Canadian fashion trend- and style-setters. It's called Canada Style and will be polybagged with Flare's November issue, available starting October 16. The special 84-page bonus magazine is sponsored exclusively by advertiser P&G Beauty. In a news release, Lisa Tant, the editor-in-chief, says: "We've packed even more news and great finds in our Canada Style issue so Flare readers are in for a treat as we showcase our style gurus and introduce a hot crop of new faces that they may not be familiar with." Among the personalities to be profiled in the issue include actress Sandra Oh, fashion designer Paul Hardy, model Irina Lazareanu, singer & songwriter Chantal Kreviazuk, Member of Parliament Dr. Ruby Dhalla, TV chef David Rocco, DJ sensation Tiga, and author Katrina Onstad. P&G Beauty will be unveiling a new advertising campaign in the special issue. "We are thrilled to further cement Flare's relationship with P&G Beauty with this exciting partnership" said publisher David Hamilton, Vice President, Rogers Publishing Limited. Magazines Canada has asked its member publications to send letters to their Members of Parliament concerning worry about the very real possibility that the longtime Publications Assistance Program (the postal subsdidy that is now administered by the Department of Canadian Heritage)and funding to the Canada Magazine Fund may be terminated. All publishers should be aware of a very real risk that funding to the Publications Assistance Program (PAP) and the Canada Magazine Fund (CMF) may be cut by the federal government. 1. Canada Post plans to cut its $15 million contribution to PAP as of April 2007. This is a contribution CPC makes to the PAP in return for exclusive authority to distribute PAP-funded periodicals. Canada Post has said it will terminate this contribution in April 2007. Despite efforts by magazine groups to argue that this will be a serious problem for many magazines, it appears unlikely that the federal government will intervene. If this cut were to occur, PAP funding would be reduced by 25% to $45 million from a current level of $60 million. 2. Culture is not part of the Harper 5 priorities. The government is in the midst of a highly centralized Treasury Board cost-cutting exercise looking to slash $2 billion on top of the $1 billion they have already cut. The Department of Heritage would not be spared from this cutting. Member magazines are being asked to write to their Members of Parliament and to Lawrence Cannon (the minister responsible for Canada Post) and Bev Oda (the minister responsible for Canadian Heritage). You don't have to be a Magazines Canada member to write such a letter, mind you, particularly if you think that these changes will have a devastating effect on Canadian magazines. Among affluent Americans (and this usually goes for Canadians, too), consumer magazine readership is as healthy as it has ever been, according to the Mendelsohn Affluent Survey, an annual study investigating the habits of Americans with income exceeding $85,000 a year. This, from a story in MediaDaily News. There were major increases for publications that specifically target the well-to-do, with a concentration among marine titles. Thus, Boating readership jumped 40 percent, Motor Boating climbed 27 percent, Continental was up 45.5 percent, Ski was up 33 percent, and Yachting was up 55.6 percent. But more mainstream pubs also enjoyed a lift in affluent readership. In the auto category, Automobile Magazine was up 31.2 percent, and Car and Driver was up 20.9 percent. In personal finance and business, BusinessWeek was up 16 percent, Barron's was up 11 percent, Forbes was up 11 percent, Inc. was up 35 percent, and SmartMoney was up 24 percent. The Internet made fewer inroads, but the changes were still significant, said the story. Mendelsohn found an increase of more than 7 percent in the number of respondents using the Internet to do their banking, and an increase of roughly 5 percent for making transactions including purchases. Rogers Publishing has taken over the website CanadianParents.com for an undisclosed price. Rogers owns Canada's largest parenting group including the magazine Today's Parent and its associated website, Todaysparent.com. Tracy Keleher, the founder and business development manager for Canadian Parents Online will continue to manage the standalone site with its existing staff (there is no suggestion of merging it with Todaysparent.com) and report to Louise Clements, vice-president of digital and interactive at Rogers Consumer Publishing. Are the wheels coming off The Walrus? Serious doings apparently afoot at The Walrus magazine. Last week, Tom Fennell, the deputy editor, quit. This was followed by the resignation of Bernard Schiff, the publisher and also chair of the Walrus Foundation; he was followed out the door by most of the rest of the board (it's not clear how many or if the board quit en bloc) including Sandy Houston, who represents the Metcalfe Foundation (which funds the Walrus's internship program). The board resignation was confirmed to the staff yesterday. Intense dissatisfaction centres on the behaviour of editor, co-founder and major investor Ken Alexander. A succession of people have quit or been pushed/driven out in the past couple of years. The very existence of the magazine depends on several factors including support money coming in from the Alexander family's Chawkers Foundation to cover the difference between what the magazine earns from circulation and advertising and its actual costs; and its hard-won charitable status, which in turn depends on an arm's length foundation that -- with the resignation of the board and chair -- is effectively crippled. This is a major shame, since so many people had such hopes for the magazine and since so many good people's salaries and freelance incomes hinge on its survival. It is hard to know what will happen next. Stay tuned. Thanks to the Professional Writers Association of Canada blog for making us aware of an intriguing initiative being taken by Boing Boing, a blog that has, er, a much larger audience than does this one. The Boing Boing Digital Emporium is a pilot project to post certain texts in pdf form that can be downloaded for a small fee [similar to Apple's i-Tunes -- see the comment below]. This would seem to be a way to not only compensate creators (writers, artists, composers) for use of their material (net of the costs of the transaction -- PayPal or similar), but also to cut out the middlemen (producer, publisher)who often take most of the action. It is early days, but this may be a real step forward, one which would allow makers to reach huge audiences AND get compensated for it. This last part has always been the hard part. One could see a situation in which freelancer writers would sell one-time rights, say to a magazine, retain all other rights, post their work through a service such as this and be paid (albeit in thousands of tiny fees)for access to it. If the magazine wanted to buy secondary or archiving rights, that would certainly continue to be possible. Right now, Boing Boing charges $1 an item, but there's no magic in that amount. If the volume was sufficient, an item could cost 10 cents, theoretically, or $20 if it had that kind of value. More needs to be known about this idea, but congratulations to Boing Boing for launching it. We don't know whether other, local or city, magazines have done something similar, but it's impressive that Spacing magazine has launched an election blog and deployed a clutch of reporters to cover the issues across the city of Toronto. Well-known freelancer (Globe, Toronto Life) John Lorinc is writing a column for the blog, which will be up until the November 13 municipal vote. 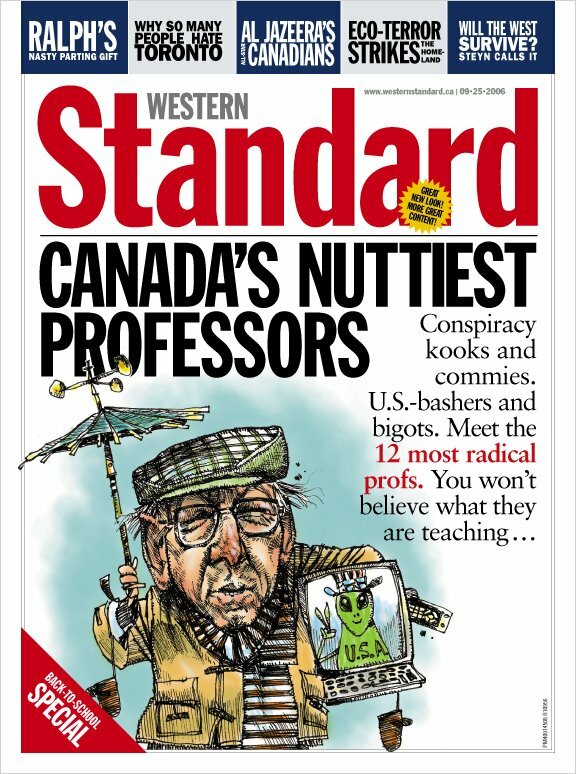 This is yet another escalation in a continuing story that ramped up considerably when a consortium of university presidents said that, after more than a decade of cooperation, they would no longer fill out Maclean's's questionnaires. They argued that the methodology was flawed and the way in which data was pressented was unfair and inaccurate. Maclean's steadfastly said it would carry on, using public sources, but the going must have been tough, because they have now had to turn to the law to compel compliance. It is not at all clear whether such a request will be of any use in this year's issue, which is due out in November. According to a story distributed by Canadian Press, Maclean’s says it has served 22 universities across the country with official requests for information. "Among other data the magazine has asked for: the number of first-year undergraduates and the number of students who stay with a university from year to year. "As public institutions, universities have the responsibility to make this information publicly available," a Maclean’s spokesman said." More information is provided in a story on CBC.ca. Days after unveiling the total redesign of the Western Standard, Kevin Libin, the editor of the Western Standard, announced he was leaving, to join the National Post as its Alberta correspondent. This, according to a story in mastheadonline (sub req'd). "Succeeding Libin is Joe Woodard, a well-known religion reporter and faith editor at the Calgary Herald. Woodard is also a founding member of the national board of directors of the Canada Family Action Coalition, whose mission is to “mobilize, train and activate Canadians in defending and promoting Judeo-Christian principles in Canadian society,” according to its website." Now I think of Bell as the inventor of one of the most ubiquitous objects in the modern world: the magazine subscription card. In 1897, as the financial backer of the struggling National Geographic Magazine, Bell re-launched the publication with an emphasis on lively writing and pictures that tell a story. And a nuisance was born — he included a blank subscription form in every copy. That anecdote is one of the highlights of Charlotte Gray's workmanlike examination of Bell's life and times. Masthead online reports (sub req'd) that the Montreal-based men's magazine MUM (Men's Ultimate Magazine), which folded after seven issues back in 2003, is being revived, this time as a quarterly. Founder Hung Le says he's older and wiser (he's now 25!). We are left to wonder if MUM stands for Make Up (Your) Mind. It's hard to see how it is distinguished from or will distinguish itself from UMM (Urban Male Magazine) let alone the plethora of US men's titles on the racks, many of which seem to be struggling. This is a category that was made for the web, so making a print publication pay is not easy. Third quarter results for Transcontinental Inc. have been released; the printer, magazine and media company (TSX:TCL.B) saw third-quarter profit fall from $27.5 million last year at this time to $24.7 million, mostly blamed by management on the impact of a strong Canadian dollar. According to the company, revenue totalled $511.8 million, down $18 million or three per cent from $529.8 million in the same quarter a year ago. Excluding the foreign-exchange effect, revenues were about the same as in 2005, the company said. A new title on mastheads? Prevention magazine, the long-established health and fitness digest book from Rodale Inc. has established a wholly new job and job description at its shop -- brand editor. According to a story in MediaDaily News, Leah McLaughlin, formerly executive editor of Natural Health has been hired to the lead as the magazine develops brand extensions across all media--print, Internet, broadcast, DVDs and mobile. "This is a way for Prevention to maintain its credibility and integrity across all platforms," says McLaughlin. "Too often, when you see a magazine brand on a product, if you're in the business, you know it's coming from [the corporate] side of the business. Editors are not involved." Sometimes new magazines come about by the most roundabout ways. Sometimes you wonder whether they are really magazines at all. Reitzik is unabashed about the reason he's doing a print magazine. It's part of the pitch: "The basic premise is that mobile content is a way to customize a cellphone," he says. "The bottom line is young people use cellphones to waste time. Older people use them to save time. We allow people to buy products and content for their phone." 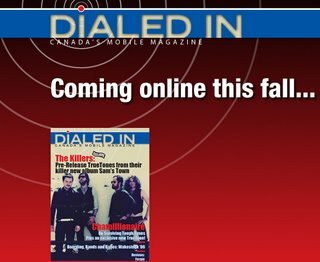 The first issue features The Killers on the cover, and inside are brief articles about the artists whose ringtones and voicetones are available for purchase. The articles are short as the focus is on getting young people to pony up the dough or enter a contest to, for example, go to a Black Eyed Peas concert and meet Fergie in person...Unfortunately for Quebecers, our complicated provincial contest rules means we can't enter, for now. Reitzik is hoping to cash in on the growing ringtone and mobile content market. At the end of 2005 there were 16.8 million cellphone subscribers in Canada, and we purchased roughly $1.5-million worth of ringtones that year, while sending 8.7 million text messages per day. If you'd like to see a pdf of the whole premier issue, go here. Time Inc. is going to put 18 of its consumer magazine up for sale, including some of its older special interest titles such as Popular Science, Field & Stream and Outdoor Life, as well as its Parenting Group, including the very big title, Parenting, according to a story in Media Daily News. According to the latest FAS-FAX from the Audit Bureau of Circulations (ABC), Popular Science experienced a 10.2 percent drop in subscriptions in the first six months of 2006 compared to the same period of 2005, with overall circulation sinking 8 percent. Field & Stream fared somewhat better, with overall circulation holding steady, but newsstand sales saw a 7.9 percent drop in the same report. Outdoor Life turned in a similar performance, with subscriptions basically even and newsstand sales down 10.6 percent. And Parenting did worst of all, with a 6.1 percent drop in subscriptions and a 25.8 percent drop in newsstand sales. Data on ad pages and revenue was equally damning. According to figures from the Publishers Information Bureau (PIB) comparing the first eight months of 2006 and the same period last year, Popular Science's ad pages fell 8.3 percent while revenue fell 11.2 percent. In the same period Field & Stream's ad pages were down 18.5 percent--while revenue was down 14.1 percent, and Outdoor Life's pages fell 13.7 percent, with a 4.7 percent drop in revenue. Mirroring its ABC figures, Parenting posted an alarming 16.5 drop in ad pages and an 11.3 drop in revenue. At the same time, Time Inc. is also getting rid of a number of magazines targeting niche audiences, like its Marine Group, with a stable of titles including Yachting, MotorBoating, and SaltWater Sportsman, and TransWorld Media, publisher of TW Skateboarding, TW Snowboarding, TW Surf, TW Motocross, Ride BMX, and Quad. The alpine division, represented by Mountain Sports Media, is also out--taking with it Ski, Skiing, and Warren Miller Entertainment. Samir Husni, the magazine commentator from the University of Mississippi, was quoted as saying that the proposed sale or auction is "huge": "Time is saying they think there's a future for the big general interest magazine, but also predicting the demise of special interest titles that are not extremely specialized. They're betting all the money on the old stable: Time, People--the ones with real mass audiences." Apparently some publishers no longer care quite so much about maintaining a subscription price of at least a dollar a copy. 13 issues of Chatelaine and 10 issues of LouLou ... all for one low price of $14.95 -- that's just $0.65/copy. Perhaps PAP funding just doesn't have the cachet it used to have. Or perhaps Rogers is rolling in mountains of moolah, so they can afford to charge readers less ... while paying the full "commercial rate" in Publications Mail postage on those copies. Edna Staebler a woman who started her career as a freelance magazine writer in the heyday of Maclean's, Chatelaine and Saturday Night in the '40s, '50s and early '60s and went on to write 20 books, including two of Canada's bestselling cookbooks, has died at the age of 100. For many years she lived in a cottage beside Sunfish Lake, near Waterloo and held court for visitors from all over the world. Originally trained as a teacher, she taught school for only one year, but was a writer for a lifetime. She specialized in writing minutely researched magazine stories telling of the extraordinary lives of ordinary people. For more than 80 years she maintained diaries, which were recently published as Must Write: Edna Staebler's Diaries (WLU Press, 2005). She was nearing 60 when, in 1968, she wrote a Mennonite cookbook called Food That Really Schmecks, which had evolved out of earlier articles she had written about the sect's life in north Waterloo. The book became a much reprinted bestseller that remains popular almost 40 years later and has never gone out of print. Among her books, some of which grew out of her magazine journalism, were Haven't Any News, Ruby's Letters (WLU Press), The Schmecks Appeal Cookbook Series (McClelland and Stewart/McGraw Hill Ryerson, 1990), Whatever Happened to Maggie (McClelland and Stewart, 1983), More Food and Schmecks Appeal (ed. ), 1979, Cape Breton Harbour (McClelland and Stewart, 1972), and Food That Really Schmecks (McGraw-Hill Ryerson, 1968). Staebler was born on the dining room table of her parent's home in Kitchener on January 15, 1906 and celebrated her 100th birthday this year. Kathryn Wardropper, who administers the non-fiction award, said at the time of Staebler's 100th birthday party (attended by 500 of her closest friends) that the birth must have been on a sunny day or in the midst of a full-blown winter storm; either would have been appropriate for a woman who was "complex, stubborn and joyful". They must have been attractive qualities, because throughout her life she maintained close friendships with some of Canada's most famous writers, including Margaret Laurence, W.O. Mitchell, Sheila Burnford, and Pierre Berton. At the time of Staebler's centennial, Veronica Ross, a Kitchener author who wrote Staebler's biography (To Experience Wonder: Edna Staebler, A Life, Dundurn Press, 2003) said: "She radiates a charisma, a joy in life. She focuses on people and makes them feel important." She received an honourary doctorate from Wilfrid Laurier University and a National Magazine Award for a 1987 story about the hilarious litigation over a Mennonite cookie recipe she published. She was honoured by the Canadian Women's Press Club for outstanding journalism in 1950. Staebler was extraordinarily generous with the proceeds from her publishing, establishing and supporting several awards including the Edna Staebler Award for Creative Non-Fiction, (administered by Wilfrid Laurier University) -- the only one of its kind in Canada. She endowed a writer-in-residence program at the Kitchener Public Library. Twenty-five years ago, she and writers Harold Horwood and Farley Mowat put up the seed money to start the award-winning literary magazine The New Quarterly, which has celebrated its 25th anniversary. In the latter years of her life she quietly made substantial gifts to many of the arts and cultural organizations she valued most. The parent/family category will be somewhat more crowded, and competitive, with the launch this March of ParentsCanada magazine, from Family Communications. It will be going up against (among others) national titles like Rogers's Today's Parent and St. Joseph's recently relaunched Canadian Family. Family Communications claims in a story in Media in Canada, that 70% of Canada's eight million parents don't currently read parenting magazines. They clearly feel that this leaves lots of room for their new publication. Publisher Jane Bradley says "there is an under-served audience of once-upon-a-time singles who didn't lose their edge when they became parents, and that the definition of 'family' is changing." Initial circulation will be 120,000 with a cover price of $4.95; the magazine will be published quarterly in 2007, with plans to move to six times a year and eventually monthly. Bradley points out that the new magazine already has a jump-start thanks to an already-established website, plus Family Communications' experience. The company has been publishing in the field of parenting for 58 years, with such titles as The Baby and Child Care Encyclopedia, Best Wishes, Mon Bébé, Expecting, C'est Pour Quand? Labour and Birth Guide, Naissance and Baby's First Years. Family Communications also publishes Today's Bride and operates CanadianBride.com. 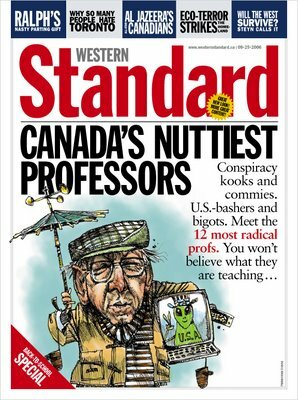 ("First comes love, then comes marriage, then comes baby..."
Maclean's magazine, somewhat beset by a mob of university presidents falling over themselves to say how they will no longer cooperate with its university rankings, has heard at least one, somewhat unlikely, friendly word. In an editorial, the London Free Press chides the universities (including London-based Western). While it agrees there may be flaws in the methodology, it says "reasonable requests are part of Canadians' right to know." For years, the Maclean's survey has created a buzz for universities across Canada that they could not have bought at any price. For a sector that has legitimate complaints about underfunding, the hobbling of a messenger is unfortunate. Interesting item from Media Daily News concerning a partnership between traditional newsstand disributor Kable Distribution Services and the digital publication distributor Newsstand Inc. It seems to involve Kable providing access to its print clients and selling digital subs as one of several alternatives, while Newsstand does all the digital fulfillment. The two companies will share any of the results (so far speculative, since the deal has just been announced and none of Kable's 600 clients have yet signed on). "There is a changing retail environment for magazines, and we have to get publications into the hands of people in the ways they are now reading them.Plus, we want to save a few trees." The Western Standard of Calgary has gone to one of Canada's most reliable and steady art direction hands, Jim Ireland & Associates, to help it redesign the newsmagazine from front to back. 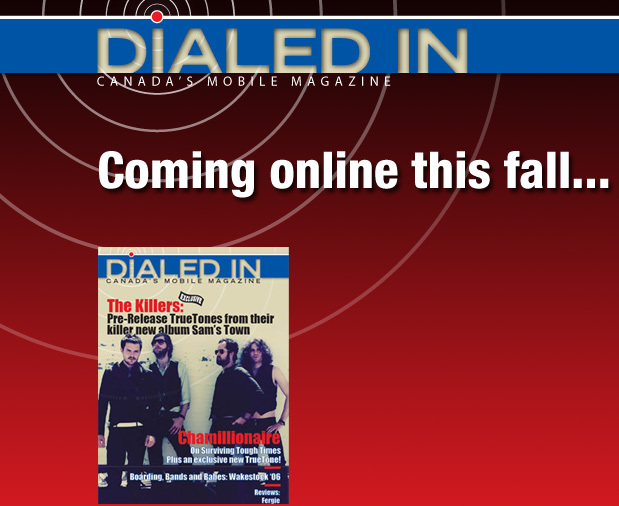 The whole new look will hit the newsstands with the September 25 issue. Here is a sneak peek. Gone is the blocky red logo box up in the corner, replaced with a bold upper and lower logo emphasizing the word "standard". A series of skybar boxes pitch 5 stories hard, at least in the cover we've seen. As will be evident, the cover subject has lost none of the edge for which the Standard is well known. James Ireland & Associates of Toronto has handled the ongoing design and the redesign of many of Canada's better magazines (Ireland has been a longtime friend of the Ryerson Review of Journalism), including the U of T magazine, Rotunda, the Imperial Oil Review and so on. In 1997, Jim received the lifetime achievement award from the National Magazine Awards Foundation. The Standard has a claimed circulation of 40,000, including about 18,000 subscribers. The first issue of the new look should probably sell a good many copies to Torontonians who are always up for knowing why everyone everywhere else hates them! Toby Heaps, the editor of Corporate Knights magazine, was profiled this weekend by the Toronto Star's Judy Steed. Whether you classify his publication a noble pursuit of positive corporate values or as a tool of the corporatist agenda, there is no question that the magazine has grown, prospered and is worth watching. Now published six times a year with a controlled circulation of roughly 100,000 (through the Globe and Mail) it has become, in effect, a platform for a whole series of awards programs that are intended to encourage good corporate citizenship. One has to wonder if any boardroom or backroom decision is based in any way on whether it will get the company on the Corporate Knights hit lists, but it is hard to argue with the fact that -- through its advertising -- corporate Canada is stepping up to support the process. It's off topic, but interesting nonetheless. The man who claimed to have invented the advertising catch phrase: "But Wait! There's More!" and who wrote the copy for the ginsu knife, has died. The recent retirement of Harvey Botting from leading Rogers's trade publishing arm, the Business Information Group, left a big management hole. That has now been filled by merging the division with the Health & Financial Group, to create the Business & Professional Publishing Group. John Milne (who ran the health and financial group) has been promoted to senior vice-president of Rogers Media and will oversee the combined operation. A story in Folio: says the Magazine Publishers of America (MPA) is working with Zinio Systems, the digital distribution company, to get U.S. college students to read magazines. Its method? To give away free digital subs to select students at various universities. The MPA's Digital College Initiative. "The magazines will reflect the curriculum being studied in specific departments...and involve subjects like engineering, film, fashion, business and international affairs," the story said. "Foreign Policy will reach a number of John's Hopkins University Advanced International Studies students, while Northwestern University management students will receive digital editions of BusinessWeek. Parsons The New School of Design Students can look forward to their digital copy of Elle, while Premiere will be sent to USC School of Cinema and Television students. University of Notre Dame Computer Science and Engineering Division students will receive Popular Mechanics." Spacing, the prize-winning little Toronto magazine, run part-time by Matthew Blackett and a bunch of dedicated urbanophiles, certainly punches well above its weight when it comes to participating in the forthcoming municipal election in Canada's largest city. 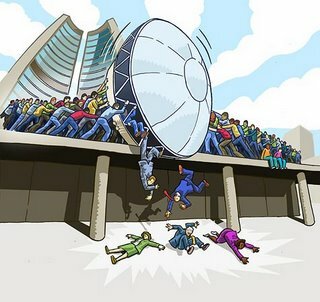 We like the illustration they used by artist Mark Ngui (see above). Spacing's new issue, due out September 18, will concentrate on the topics that it feels City Hall should make its top priorities, and it has a report card on the councillors ("we identify the star pupils and problem children"). It will have a launch party, as usual at the Gladstone Hotel (Queen and Dufferin) on Thursday, September 28 (doors open around 8pm). $10 gets you in and a magazine. They're also launching a special election blog called Spacing Votes (goes live September 18) and co-sponsoring a mayoral debate with Eye Weekly (date and location to be announced). Marie Hill, originally from Black's Harbour, N.B., is to be inducted into Communicators Hall of the Harness Racing Hall of Fame, according to Standardbred Canada. Hill, who had her first writing byline at age 11, has covered harness racing for major trade magazines, but she is best known in the sport as a prolific author, writing about racehorse-stallion star Adios, fellow native Canadian Joe O'Brien, and Single G, "The Horse That Time Forgot." She and six other honorees will be feted first at the Harness Writers' annual awards banquet on Feb. 25, 2007 at the Borgata in Atlantic City, and then will be formally inducted during the Hall of Fame Weekend in Goshen, New York over the Fourth of July 2007. People in the business have always looked up to Canadian Geographic, as a robust mid-sized title in a country with few of them, as an excellent and prize-winning magazine and as a real publishing success story. Hence the dismay and puzzlement when, last Friday (September 1), seven people, including a couple of senior and longtime employees, were abruptly terminated Among them were Ian McKelvie, Senior Marketing Manager, Margaret Williamson, Photo Editor and Caroline Milano, Coordinator Society Programs. The others were: Jodi Di Menna,Assistant Editor; John Burridge, Production Artist; Tobi McIntyre, New Media Coordinator; and Celine Parisien, Art Director, Special Projects and Promotions. The story of how, 12 years ago, Michael De Pencier and Key Publishers took a 50% stake in Canadian Geographic Enterprises (with the Royal Canadian Geographic Society) and helped turn the magazine around has taken on an almost mythic quality. It has been held up as a model for how certain specialty titles can thrive under a foundation structure. Can Geo has an audited circulation of 210,000 and a readership of almost 4 million and an apparently robust merchandising arm. About four months ago a number of people, mostly contract employees, were let go, but assurances were given to staff, and outsiders, that this was a minor business adjustment. Mere months after John Thomson announced he was leaving as Publisher to work on a new project with Key Publishers (who recently sold their 50% interest in CGE), the new publisher apparently felt that he had no choice but to cut staff drastically, including long-term employees. Thomson, who is a past Chair of Magazines Canada, had been spending a good deal of his time away from Can Geo in the past year, working on several new CGE projects , including one called the BC Experience. When Key announced that it wanted to sell its 50% interest, André Préfontaine, lately the President of Transcontinental Media, was hired as a consultant, helping CGE to find a sympathetic partner. When a partner acceptable to the Society board could not be found, the directors decided to buy the 50% back themselves and offered the publisher's job to Préfontaine. Once the purchase and sale of the 50% was formally closed, the seven staff were terminated. In Touch magazine's goal in life is to become the number one newsstand title, and it looks like it is within casting distance, according to a story in Women's Wear Daily (WWD). The two celebrity titles that went toe-to-toe used to be People and US Weekly, but Bauer's In Touch has moved into second place and is breathing down People's neck, says the story. "For example, the Aug. 21 issue saw In Touch come within a few thousand copies — or even overtake — People as the top newsstand seller, depending on whom you cite. According to several sources familiar with scan data, People's Aug. 21 issue with the recycled cover story "Before They Were Stars," sold 1.24 million copies, compared with the 1.26 million copies In Touch sold that same week with its cover story on Jessica Simpson. The same sources also claim People's Sept. 4 issue with a report on the JonBenet Ramsey case sold 1.26 million, while In Touch's issue with a cover on Nicole Richie's shocking weight loss came in at 1.34 million copies. "In Touch declined to confirm the numbers, but publisher Bob Davidowitz said: 'We had a very strong August. Our goal with In Touch is to be the category leader in single-copy sales, and we are on the way to doing just that.' "
Meanwhile, publishing sources close to People said the magazine's Aug. 21 issue outsold In Touch by 200,000 copies (1.3 million versus 1.1 million), and the Sept. 4 issue is on track to sell more than 1.4 million copies. A spokeswoman for People said the company does not give out its sales figures prior to reporting the numbers to Audit Bureau of Circulations. WWD speculated that In Touch's momentum might have something to do with celebrity readers being squeezed at the pump and in their paychecks: The weekly is a bargain buy at $1.99 and ran a 25 cent promotion during the first half, while People carries a $3.49 cover price and boosted it to $3.99 when it featured exclusive pictures of Shiloh Nouvel Jolie-Pitt, the newborn baby of Brad Pitt and Angelina Jolie. Connell joined Today’s Parent in 2002 as Senior Editor and was promoted to Executive Editor in 2003. Connell took a lead role in creating the Today’s Parent For Kids’ Sake Awards and a groundbreaking survey on breastfeeding that will appear in the next issue (October 2006). Connell earned her master’s degree in journalism from the University of Western Ontario and has worked at numerous newspapers and magazines. In 1992, she joined Chatelaine as Senior Editor and was promoted to Managing Editor in 1997 before moving to Today’s Parent in 2002. Ryerson University is the latest to refuse to cooperate with the Maclean's magazine university rankings. That brings the total schools to 23 (we're beginning to lose count), including most of the biggest universities in the country. Maclean's insists it will carry on, but it must be asked whether this is whistling in the dark and whether the study will have any credibility with the public when it comes out in November. We have been reserving judgement on Ryerson's participation in the 2006 survey until the Maclean's response to the recent wave of university withdrawals became clear. It was our hope that Maclean's would respond this year to the concerns of many Canadian universities by beginning to make major changes to the rankings ("league tables") in this fall's annual University edition, and by offering to discuss other possible revisions to the survey. Regrettably, Maclean's continues to insist that the rankings will be compiled as usual, using the present system. Survey methodologies have come a long way since Maclean's started to publish the university rankings issue. Like other universities we now publish our own indicators, including NSSE and CUSC surveys. We believe deeply in accountability to our students and the public, and we recognize that students make comparisons. However, the information they use must be meaningful. According to a post in mastheadonline (reg. requ'd) Murray Lewis, until recently the editor of Our Canada, the largely reader-written offshoot of Reader's Digest, is to be the editor of Good Times, the English language version of Le Bel Age which has been relocated to Montreal by its parent company, Transcontinental Media. The Toronto team which has been producing Good Times has been let go.